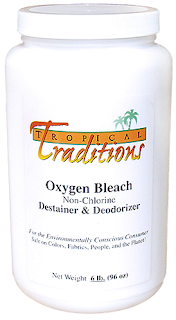 I've been trying out Tropical Traditions Oxygen Bleach for a couple weeks now and I love how versatile it is! It's a Detainer and Deodorizer that cleans laundry, carpet, your bathroom, yard...etc. I've been doing Bikram yoga again. My clothes end up completely drenched with sweat and sometimes they don't immediately hit the washer...ewwww, I know... anyway adding Oxygen Bleach to the load makes my clothes come out perfect! I also mixed some Oxygen Bleach with water and used it on a carpet stain (green watercolor paint on my white rug) and it came out! I love that there is no chlorine, hence no chlorine smell, AND that it works on some many different surfaces! Right now you can get 6lbs. of Oxygen Bleach for $16.75! AND until midnight tonight (11/29) you can get $10 off using code fri251111, you just need a minimum purchase of $16. In the laundry Oxygen Bleach is used to destain, deodorize, and whiten. It is very effective as a laundry presoak for heavily stained articles. For light soils add 1 ounce of Oxygen Bleach with your laundry detergent per load. For moderate soils use 2 ounces and for heavily soiled articles use 4 ounces. To whiten and deodorize diapers add 4-6 ounces of Oxygen Bleach into the soak cycle. Soak in hot water for at least 30 minutes, or overnight, then complete wash cycle. For whitening old linens and yellowed window shears, deodorizing and cleaning tennis shoes, or to get rid of yellow armpit stains on shirts: soak in 2 ounces of Oxygen Bleach per gallon of water for at least one hour, or overnight, then rinse. For stained plastic ware, dishes, dish rags and dish towels add 1-2 ounces of Oxygen Bleach to the container to be cleaned or to the dishwater and soak for at least 15 minutes. To keep your drains and disposals clear and smelling fresh add 1 ounce of Oxygen Bleach in 8 ounces of hot water and allow solution to sit in drain overnight. For septic systems add 4 ounces of Oxygen Bleach to toilet and flush into the septic system twice a week. For toilets add 3 ounces of Oxygen Bleach, wait 15 minutes then scrub. For shower curtains soak in one ounce of Oxygen Bleach per gallon of hot water; for mildew stains soak overnight. For bathtub and shower use make a paste of Oxygen Bleach with hot water, scrub with a cloth or sponge, wait 15 minutes then rinse or use. For deodorizing garbage cans add 1/2 ounce of Oxygen Bleach per gallon of water and let soak. For lawn furniture add 2 ounces of Oxygen Bleach to hot water, scrub, wait 15 minutes, then rinse. For all weather carpeting add 4 ounces of Oxygen Bleach to a gallon of warm water scrub with a stiff broom, wait 20 minutes then rinse. To destain and deodorize carpets add one ounce of Oxygen Bleach per gallon of carpet shampoo prior to cleaning. To remove mold and mildew from carpeting add 2-4 ounces of Oxygen Bleach per gallon of hot water, apply generously to stain, wait 10 minutes, then vacuum with extractor. For acoustic tiles add 6 ounces of Oxygen Bleach per gallon of hot water, spray on tiles, wait 15 minutes then rinse. For mops add 3 ounces of Oxygen Bleach to a gallon of hot water, soak overnight then rinse. For mildew removal or to clean baseboards or basement floors after water damage from flooding add 4 ounces of Oxygen Bleach to a gallon of hot water, scrub surface, wait 30 minutes then rinse.Oxygen Bleach is safe for use in a closed environment. To clean and deodorize cat litter boxes soak them in 3 ounces of Oxygen Bleach per gallon of water for 20 minutes then rinse. For urine, feces, or vomit stains on carpets or upholstery, add one teaspoon of Oxygen Bleach to 8 ounces of water, wipe onto stain, wait 10 minutes then rinse. To clean and deodorize coolers add 2 ounces of Oxygen Bleach per gallon of hot water, soak for 20 minutes, then rinse. For boat sails, cushions, ropes, camping gear, tents, tarps, etc. add 4 of Oxygen Bleach ounces per gallon of hot water soak for 30 minutes then rinse. Oxygen Bleach is excellent for cleaning and restoring wood decks. It removes organic stains from leaf stains to BBQ grease, removes mold and mildew as well as sun faded and discolored wood layers. Makes your deck look almost new!!! It doesn’t harm your plants, grass, or landscaping in any way! To clean your deck first remove any loose soils or other matter. Dissolve 6 ounces of Oxygen Bleach Destainer and Deodorizer in a gallon of hot water (generally takes about 5 minutes). Apply to wet deck. One reader will win 6lbs. 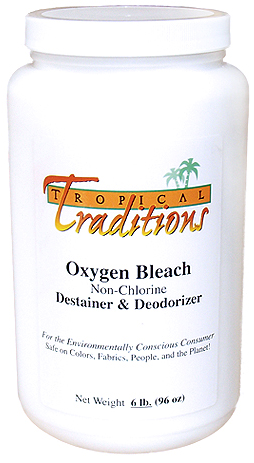 of Tropical Traditions Oxygen Bleach! Giveaway will end Tuesday December 13th at Midnight MST. Winner will be chosen by Random.org. All information gathered for the giveaway will be discarded when over. Tropical Traditions provided me with a free sample of this product to review, and I was under no obligation to review it if I so chose. Nor was I under any obligation to write a positive review or sponsor a product giveaway in return for the free product. I would like to try Pumpkin-Coconut Squares recipe. i want to try Gluten Free Pumpkin Bread. Btw. i can't see your facebook page. im in canada. I would like to try the recipe for coconut shrimp and rice. i would like to try the gluten free chocolate bars. I would like to try the coconut peanutbutter popcorn balls! I think the Coconut Peanut Butter Popcorn Balls sound wonderful! Black and White Toasted Coconut Fudge sounds good.